Passover is not only a festival of freedom, it is a festival of creativity as well. There has been a myriad of art created about Pesach and for Haggadot as early as the 1200s. 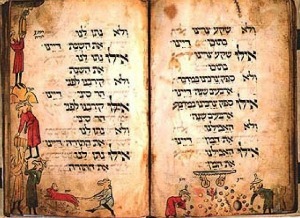 The Haggadah began to evolve during the Tannaic period in Israel. Traces of it can be found as early as the Mishnah in Pesachim, Ch 10. However, the Haggadah as we know it didn't begin to take shape until the Geonic period (6th to 7th centuries). I will endeavor to give a few examples of Haggadot throughout the ages. The earliest known Ashkenazic Haggadah that bears illustrations was called the Bird's Head Haggadah. It gets its name from the depictions of people with birds' heads; perhaps from the proscription against making a graven image. 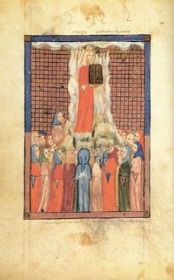 The oldest Sephardic Haggadah is thought to be the Sarajevo Haggadah, created in Barcelona around 1350 CE. It may have been taken out of Spain in 1492, when the Alhambra Decree expelled the Jews. It surfaced in Italy in the 1500s and it has survived many wars. It also was smuggled out of Sarajevo during the Nazi regime, protected by Muslims in a mosque. It now has a permanent home at the National Museum of Bosnia and Herzegovina in Sarajevo. Haggadot have been decorated in various degrees throughout the years since. This next one, from Yemen, simply has crowns on the top of each page. It was published in the 19th century. As you can see, there are a variety of wine and food stains on it. Haggadot were meant to be used. The stains are part of their history. The handwriting is indicative of the time and place: a combination of medieval script and Torah script, with the commentaries on the side in Rashi script, reminiscent of a Talmud page. The text was written on discarded Torah parchment, as it was the Yemenite custom to reuse scraps of holy books. This next example is known as The Copenhagen Haggadah. It was created in Altona-Hamburg in 1739, the work of Uri Pheibush son of Isac Eisik Segal (also known as Philip Isac Levy). 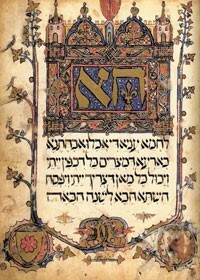 It boasts of being a unique Haggadah, in that it is both the Ashkenazic and Sephardic traditions combined. The main text is in Ashkenazic style, with the commentaries and translations, which are in Hebrew and Ladino, written in Rashi script. 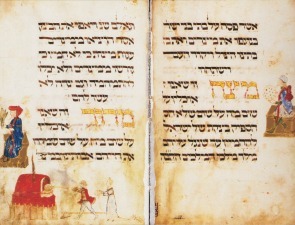 It is extensively illustrated, with large, colorful depictions of every part of Haggadah, as well as word play. Here you can see the word, sh'fokh (pour). The letters are drawn as strips of cloth, while the vowels are clovers. The middle branch of the shin is a hand holding a shofar. The final khaf also looks like a grogger ― perhaps an unintended reference to Haman, the villain in the Purim story? In 1941, Saul Raskin published his famous Haggadah. Illustrated with his drawings frequently taking up the entire opposite page, it is two-toned, mostly in black and white, with a drawing on the last page of the book of the artist taking off his glasses, bearing the inscription “sof” (end). 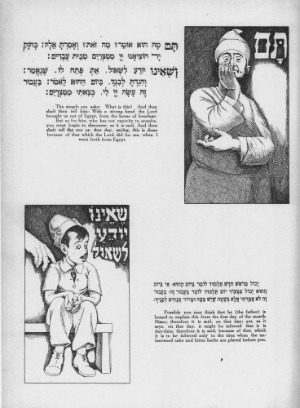 Three of the four kinds of children are depicted as adult men; the chacham (wise) is dressed like a sage, the rasha (wicked) as a soldier, the tam (simple) as a simpleton, and the sheino yodeia lishol (one who does not know how to ask) is a child. 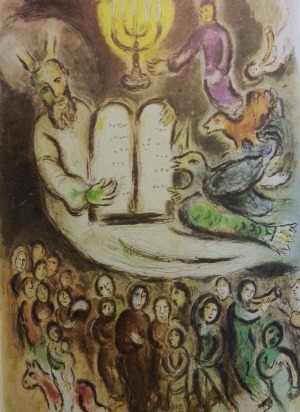 In the late 20th Century, Marc Chagall was commissioned to illustrate a limited edition of the Haggadah. Halfway through the work, he called the publisher, and suggested, 'Why don't we illustrate the entire story of the Exodus instead of the more limited story of the Passover?' 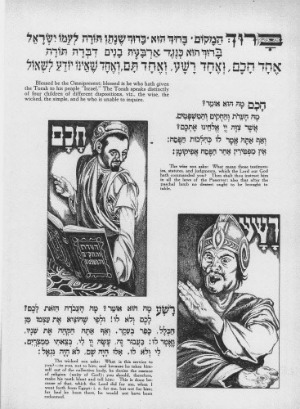 In 1987, an edition of the Haggadah was published with not only most of his illustrations of scenes from the Haggadah, but the others as well. Here is a page showing Moses (who is always depicted with the beams of light shining upon his head) with the tablets. It is opposite the Haggadah’s sections of Korekh, Tzafun, and Barekh, perhaps suggesting that the Torah is our sustenance. In 2001 Matan Arts published a very unique-looking Haggadah. It it in the shape of a D, so it opens to an oval. It begins with a map of old Canaan, with the tribal divisions. The English translations, on the right, are written in a style similar to Zapf Chancery (like the New York Times masthead) and are in King James English, from the Latin. 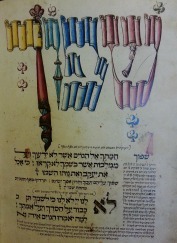 The Hebrew is vocalized, and each page is framed, with illustrations throughout. There are many wonderful Haggadot to choose from nowadays. Reform Haggadot include The Open Door, edited by Rabbi Sue Levi Elwell and art by Ruth Weisberg, The New Union Haggadah (revised edition), Sharing the Journey – The Haggadah for the Contemporary Family, and A Passover Haggadah, illustrated by Leonard Baskin. Other options are The New Haggadah (Reconstructionist), edited by Rabbi Mordechai Kaplan et al, illustrated by Leonard Weisgard, The Ma'yan Passover Haggadah, edited by Tamara Cohen, The Freedom Seder (without illustrations, but which includes a plethora of 60s songs and poetry), assembled by Rabbi Arthur Waskow, and even the ever popular Maxwell House Haggadah. There are feminist Haggadot like The Women's Haggadah by E. M. Broner and there is the Cincinnati Haggadah - published on CD-ROM in 2000 in honor of the 125th anniversary of Hebrew Union College-Jewish Institute of Religion. 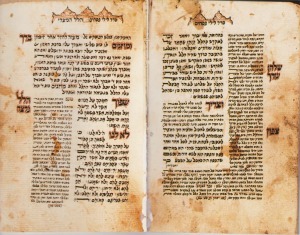 This Haggadah was created in the late 15th Century, probably in Germany, as the scribe was Meir Jaffe ben Israel of Heidelberg. Copies of this CD-ROM and further information can be obtained by emailing HUC-JIR. For children, there is the illustrated A Children’s Haggadah. There are also Haggadah coloring books for small children, like the one published by Kar-Ben. Almost all of these have illustrations and/or photos and many of them have music. Listen to Cantor Kathy Barr's recording of the “Order of the Seder,” based on the ancient Babylonian chant. Cantor Kathy Barr was ordained in 1996 by the Academy for Jewish Religion. She is a member of American Conference of Cantors and has served Reform temples in the New York City area for 17 years. She edited the Hebrew for the third Ma'yan seder Hagaddah. She currently serves as the Cantor of Temple Beth Sholom in Queens, NY.